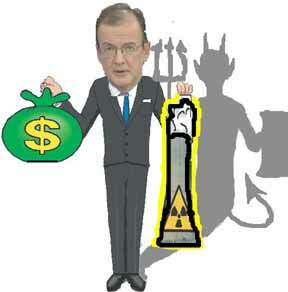 Tony Abbott – the mad monk and Ziggy Switkowski are spruiking nuclear power – again! Tony Abbott has called on the Morrison government to sharpen the political contest with Labor ahead of the election by moving to lift the prohibition on nuclear power, as Bill Shorten leaves the door open to reviving the now “dead” national energy guarantee. The former chair of the Aus­tralian Nuclear Science and Tech­nology Organisation and current chair of NBN Co, Ziggy ­Swit­kowski, told The Weekend Australian yesterday it was sensible to clear the regulatory pathway for the next generation of small ­nuclear reactors. A revived debate over nuclear power was also backed by North Queensland MP Warren Entsch, a supporter of the NEG, who said all elements of energy policy should be on the table. Speaking on 2GB radio in Sydney yesterday, Mr Abbott said there was “absolutely no reason why, when it’s economic, we shouldn’t have nuclear power generation in ­Australia”. The push to revive the nuclear debate follows Scott Morrison declaring the NEG dead, while opposition energy spokesman Mark Butler this week held out the prospect of Labor moving to revive the policy in government following engagement with industry. LNP MP Luke Howarth, in the Queensland seat of ­Petrie, said the nation “should be having the discussion about how to build a ­nuclear industry” because it would help drive the “jobs of the future”. In that hypothetical scenario, Florence was bigger than if it would be if it had occurred in a world with no human-caused warming, climate modeler Kevin Reed of Stony Brook University in New York and colleagues conclude in a study posted on the university’s website September 12. And thanks to warmer sea surface temperatures and more available moisture in the air, it would dump 50 percent more rain on the Carolinas, the researchers predict. AN “extremely dangerous” super typhoon predicted to be the one of the strongest systems on record is howling towards Hong Kong and the Philippines with up to 43 million people in the firing line. Typhoon Mangkhut is the equivalent of a Category 5 severe tropical cyclone, boasting maximum sustained winds of 205kph and gusts up to 285kph. Bureau of Meteorology Australia tropical climatologist Greg Browning told news.com.au that Mangkhut was “significantly stronger” than Hurricane Florence which is simultaneously hurtling towards the US as North Carolina locals evacuate the region to avoid the onslaught. “(Mangkhut is) relatively rare (because it’s) at the top of the severe scale,” Mr Browning said. It’s extremely dangerous as it’s a very large system with very strong winds and a potential storm surge over a large distance. Mr Browning said Mangkhut was the most powerful storm system to have developed on Earth this year but that it wasn’t the strongest since records began in 1946, as has been reported internationally. Typhoon Haiyan – which killed more than 6,000 people when it lashed the Philippines with maximum sustained winds of 230kph and gusts of 325kph in 2013 – holds that record. On Friday, Mangkhut was in the Pacific, about 450km from the Philippines with the 125km-wide eye expected to make landfall on the country’s largest island, Luzon, on Saturday. The Global Disaster Alert and co-ordination System (GDACS) said it expected a “high humanitarian impact based on the storm strength and the affected population in the past and forecasted path” of destruction. As many as 43 million people could be exposed to Mangkhut’s cyclonic winds, according to the GDACS. More than four million Filippinos are reportedly at risk of the storm which could drench areas as far south as the country’s island capital, Manila. Mr Browning said the super typhoon was then likely to continue tracking west to Hong Kong and southern China, jeopardising millions more lives, on Sunday and Monday. The Joint Typhoon Warning Center in Hawaii has categorised the system as a “super typhoon“ which Mr Browning said equates to “very destructive winds” and heavy rainfall that’s likely to cause infrastructure damage anywhere it hits. “But the biggest killer of all with a system like this is typically the storm surge,” he said. With a 900km wide rain band – which is 50 per cent bigger than Haiyan’s – combined with seasonal monsoon rains, the typhoon could also set off landslides, according to forecasters. Countries across east and southeast Asia are issuing emergency alerts and ordering evacuations as both Mangkhut and a second storm, Typhoon Barijat taunt the region. Mangkhut is forecast to hit the northeastern Cagayan province of the Philippines, early on Saturday local time. Office of Civil Defense chief Ricardo Jalad told an emergency meeting led by the Philippines President Rodrigo Duterte that about 4.2 million people in Cagayan, nearby Isabela province and outlying regions were vulnerable to the most destructive effects near the typhoon’s 125km-wide eye. Nearly 48,000 houses in those high-risk areas are made of light materials and vulnerable to Mangkhut’s ferocious winds. Storm warnings have been raised in 25 provinces across the Philippines restricting air and sea travel. Schools have been closed and bulldozers are on standby in the event of landslides. The military and police in Luzon have been placed on red alert — barring all troops from going on leave — so they can respond to emergencies in communities expected to bear the brunt of the typhoon. Cagayan Governor Manuel Mamba told local media that this typhoon was “very different, this is more complicated because of possible storm surges”. The Hong Kong observatory’s tracking system shows a 70 per cent probability that Mangkhut could deviate within a 500km radius from its predicted position, causing uncertainty over the next few days. The observatory warned of rough seas and frequent heavy squalls, urging residents of the densely populated financial hub to “take suitable precautions and pay close attention to the latest information” on the storm. Australian expat Alexis Galloway, who lives in Hong Kong, told news.com.au the government this morning “announced on the radio they are opening 47 emergency shelters once the T3 is raised”. “This is the first time I’m actually quite nervous (about a typhoon) … we live right on the water too and 15 minutes from Shenzhen! Right in the thick (of it),” she said. The system is already stronger than any of the 15 past severe or super typhoons that warranted the highest “No 10” warning sign, the South China Morning Post reports. On the Chinese mainland, the three southern provinces of Guangdong, Guangxi and Hainan are co-ordinating preparations, including suspending transport and moving people to shelter inland, the national meteorological agency reported. The area is home to a string of megacities and more than 100 million people. Guangdong, China’s manufacturing hub, has set up 3777 shelters, while more than 100,000 residents and tourists have been moved to safety or sent home. The province has recalled more than 36,000 fishing boats to port, while train services between the cities of Zhanjiang and Maoming have been suspended and all ferry services between the Guangdong and Hainan have been put on hold. Australia’s position as a green building world-leader looks set to continue with a raft of leading companies signing up to the World Green Building Council’s (WorldGBC) Net Zero Carbon Buildings Commitment being announced in San Francisco this week. The post Aussie big business signs up to Net Zero Carbon Commitment appeared first on RenewEconomy. Deloitte report says the case for renewables has never been stronger, and smashes a few myths along the way. The post The case for renewables has never been stronger, says Deloitte study appeared first on RenewEconomy. Construction is underway at AGL’s Coopers Gap wind farm in south-east Queensland, and that means delivery of “the largest wind turbine blades ever transported in Australia.” The post “Largest ever” turbine blades en route to Australia’s largest wind farm appeared first on RenewEconomy. Regulator’s report into July 9 event in South Australia points to outrageous gaming of the energy market in that state. Customers are getting screwed, but it’s not the fault of wind or solar. The post Regulator’s report points to outrageous gaming of South Australia energy market appeared first on RenewEconomy. Doesn’t Cory Bernardi get it? – that the nuclear lobby now loves to believe in climate change – so it can pretend that nuclear power is the cure. Cory Bernardi writes to Angus Taylor, asking for nuclear moratorium removal, 2GB LUKE GRANT , 14 Sep 18, Senator Cory Bernardi has written to the Federal Energy Minister, asking him to remove the moratorium on nuclear energy. The Australian Conservatives’ leader has asked Angus Taylor to support a bill to lift the blanket ban on nuclear. With 40% of the world’s uranium resources residing in Australia, Bernardi says the government would be “mad” not to pursue the power option…………. Bernardi adds that the Morrison Government needs to withdraw from the Paris Agreement, to show that they have fully liberated themselves from Turnbull’s beleaguered energy agenda.